Estonian property development company Prana Property is currently not ready to accept the Riga City Council's offer to buy the Estonian company's share in a property at 20 Priedaines Street in Riga's Zolitude neighborhood, where a Maxima supermarket collapsed in November 2013, informs LETA referring to Olegs Burovs, head of the Riga City Council's Property Committee. "We offered them to either sell the property to the Riga City Council or to exchange it for a similar property. If we buy the land plot, we will dismantle the remaining constructions there. Prana Property has not accepted our offer as yet," said Burovs. The Riga City Council offered to set the price at 60 euros per square meter. In that case, the property would cost at total of 600,000 euros, and Prana Property would be paid 200,000 euros for its share, explained Burovs. Burovs said that the Estonian company did not accept the offer and appeared to be uninterested in similar properties the land plot could be exchanged for. This means that the dispute could only be settled in court. Prana Properties board member Raul Keskula said that the company was open for new proposals and looking for a compromise with the Riga City Council. "We are continuing our work and still hope to reach agreement with the local government. We are well aware of the background behind this sorry building, and we are aware of the scale of the tragedy that happened there. That is why we are trying to arrive at a solution that will be acceptable to all sides," said Keskula. He explained that the price currently offered by the Riga City Council would be an acceptable price for just the land plot, but there is a building sitting on it that can still be completed. 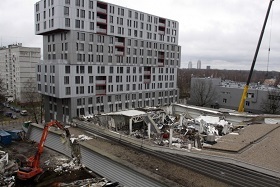 Burovs, in turn, said he did not believe that the Riga City Council would agree to buy the property for millions of euros so it could simply destroy the building later. He estimates that the cost of tearing the building down will be 600,000 euros to 700,000 euros, therefore 200,000 euros could be the maximum amount offered to Prana Properties. On the other hand, Keskula said that 3.9 mln euros had been paid for the building, so his company would continue to negotiate with the Riga City Council about all available options. At the moment, the property at 20 Priedaines Street consists of a land plot of 10,065 square meters in area and an incomplete apartment building. The Riga City Council owns 7,340 square meters of the property. As reported, a Maxima supermarket, located at the same address as the apartment building, collapsed in 2013, killing 54 people. The property now belongs to Prana Property, a subsidiary of Estonia's Coop Pank (formerly Eesti Krediidipank).